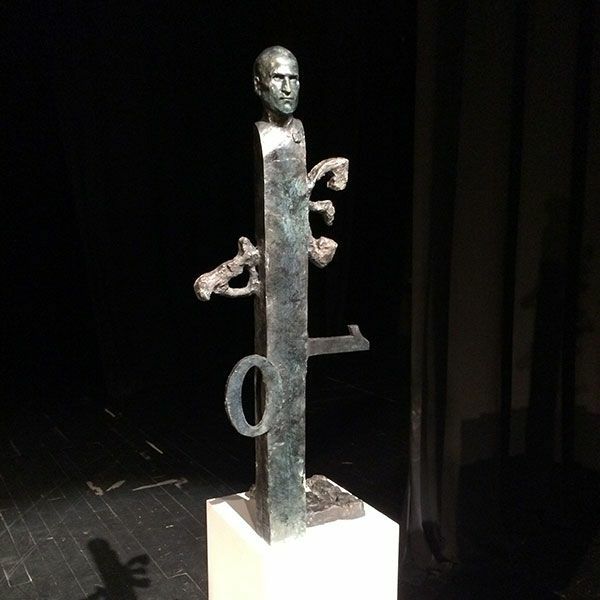 Like some totem out of Clive Barker’s Hellraiser series, a bizarre and grotesque statuary tribute to the late Steve Jobs was unveiled in Belgrade, Serbia today. Even more bizarrely, Apple may have liked it enough to put it on display in one of its Cupertino offices. The statue was created by sculptor Dragan Radenović and features Steve Jobs’ decapitated head impaled upon the top of a metal column. Two binary numbers, 0 and 1, and Cyrillic letters, possibly indicating the true name of Shubniggurath, adorn the column. Obviously, it’s pretty hideous, and doubtlessly not the kind of thing Steve Jobs himself would like, but supposedly Apple’s senior management themselves “liked the imperfections of the piece” and chose it of 10,200 entries to display in Cupertino. An Apple senior management official liking the imperfections in a statue of Steve Jobs. Anyone else think the idea that this thing will be flown to Infinite Loop headquarters is a bit hard to swallow?